Home to the CCC-built Bear Mountain Ski Trail, Bear Mountain was once considered for a lift served ski development. The potential development likely never went beyond initial scoping. 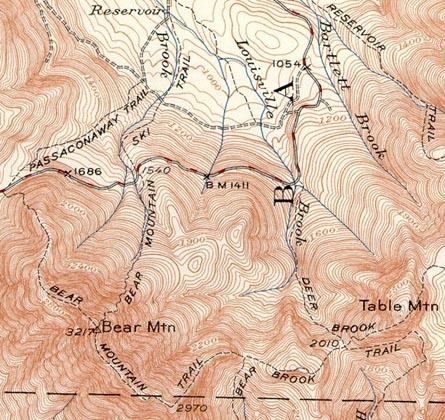 Though located in the same town and sharing a common name, Bear Mountain is not the same as Attitash's Bear Peak area. There are no known remains of the Bear Mountain Ski Area.
" MacNeil and Hannah followed the old ski trail from the point where it crosses the Bear Notch Road to the Summit. The route has no potential. The grades average about 10% to the 2100' elevation and there does not appear to be any way to improve this. From that point grades steadily increase to the 2450' elevation where the trail slabs a ledge with a 60% traverse. From this point to the top, the trail continually slabs the fall line. It is impractical to design a trail of useable width across these traverses which in some place contain grades up to 75% "